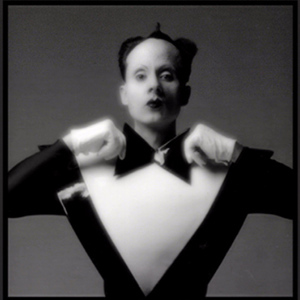 Klaus Sperber (January 24, 1944 - August 6, 1983), better known as Klaus Nomi, was a German countertenor performer, noted for his remarkable vocal performances and unusual stage persona. He became one of the first celebrities to die of AIDS, in 1983. Nomi moved from Germany to New York City in the mid-1970s. He began his involvement with the art scene based in the East Village. After a chance meeting in a nightclub, David Bowie hired him and Joey Arias as back-up singers for a performance on Saturday Night Live on December 14, 1979. Nomi also collaborated with famed producer Man Parrish. In the 1990s, Nomi was frequently mentioned in Dennis Miller's monologues as one of his favorite obscure references. Talk radio host Rush Limbaugh will often play Nomi's cover of Lesley Gore's You Don't Own Me on his program (as introductory music for news items regarding homosexuality). A cartoon called "The Venture Brothers" had Klaus with David Bowie. Episode 213 26 "Showdown at Cremation Creek (Part II)"
Died: August 6, 1983 (aged 39); New York, NY, U.S.